By Dan Ambrose: Andre Ward isn’t giving Saul “Canelo” Alvarez (42-0-1, 30 KO’s) much of any chance at beating Floyd Mayweather Jr. (44-0, 26 KO’s) this Saturday night. In fact, Ward is only giving Canelo a puncher’s chance of winning this fight against the faster and much more experienced Floyd. Ward believes that Canelo maybe can score a knockout if he lands a really big puncher, but barring that happening, he doesn’t have a real chance at winning. Ward also thinks the huge amount of water weight Canelo will be taking off to get down to the 152 pound catch-weight is going to possibly hurt his stamina down the stretch. Canelo will put the weight back on after he likely rehydrates to the mid-170s, but just the going through the ordeal of dehydrating for a week to get to 152, and then putting back 20 lbs. quickly in just one day, it’s going to likely leave the red-haired Canelo sluggish in the later rounds. I wouldn’t be surprised if Mayweather knocks Canelo out either. If Mayweather Jr. sees Canelo huffing and puffing by the 4th or 5th rounds like he was against Austin Trout, he’s going to turn on the overdrive and overwhelm him with punches. 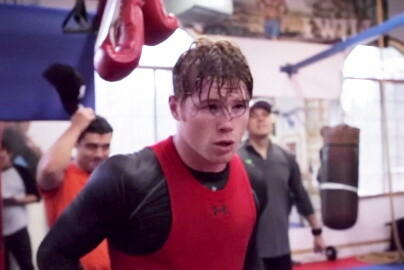 Probably the real reason why Canelo couldn’t do anything after he knocked Trout down with a single punch in the 7th was because he simply didn’t have the stamina to throw more than 1 or 2 punches at a time without needing a rest break to catch his breath. Trout didn’t have the sense to go after Canelo, but Mayweather Jr. will if he smells fatigue and sees Canelo’s face turning red and his mouth wide open like a big gold fish out of water.